Israel says the barrier will stop Palestinian terrorists. Palestinians call it a land grab. JERUSALEM (CNN) -- Palestinian farmers in the northern Jordan Valley on Wednesday received letters stating Israel would use their property to erect a security barrier, Palestinian officials said. Palestinian Authority officials subsequently fired off protests to the United States and the European Union. They said the commander of the Israel Defense Forces' central command had ordered the land confiscation. Israel says the barrier, which it calls a security fence, is necessary to stop Palestinian terrorists from entering Israel. The West Bank barrier generally runs close to the pre-1967 Mideast war border -- the so-called Green Line -- but dips into the West Bank to include some Jewish settlements. Israel says a new section will extend deep into the West Bank, surrounding several West Bank towns. Israelis some 15 miles inside the West Bank. The barrier's projected path runs mostly along the dividing line between Israel and the West Bank, but veers in to encompass Ariel and other Jewish settlements in the West Bank. The notices reportedly came as Israel lifted closures on most West Bank cities. The IDF released a brief statement about that action. "Following an assessment of the situation, the IDF has decided to remove the closure from all West Bank cities except for Nablus and Jenin," it reads. Palestinians continued their criticism of the building of a barrier as a land grab, accusing Israel of confiscating Palestinian land to build the barrier. Previously, Palestinians have noted fence construction around the settlements does not follow the so-called Green Line, the frontier between Israel and the West Bank before the 1967 Mideast war. According to Defense Ministry spokeswoman Rachel Niedak-Ashkenazi, the planned fence route, which has been approved by the government, will be 690 kilometers (429 miles) long. Cost is estimated at $1.5 billion. On October 20, Israeli Prime Minister Ariel Sharon told the Israeli Knesset that construction of the barrier would be accelerated. The Israeli government began building the barrier last year. 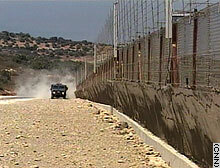 In some spots, it is an electric fence topped with razor wire and in other spots a concrete wall. Israeli Prime Minister Ariel Sharon's office on Wednesday issued a statement on the exchange of prisoners with the Islamic militant group Hezbollah. "Prime Minister Sharon has decided to bring the issue of the release of captives ... for government approval in the upcoming government meeting on Sunday," Sharon's office said in a statement. Germany has been facilitating talks between Israel and Hezbollah to negotiate a prisoner exchange. Israeli negotiators departed last week for Germany with a list of prisoners Israel would release in exchange for the freeing of Israeli businessman Elhanan Tannenbaum and the bodies of three Israeli soldiers: Benny Avraham, Adi Avitan and Omer Souad. Hezbollah, based in Lebanon, waged a campaign for 18 years against Israel's occupation of southern Lebanon as a self-declared security zone. Israel withdrew its forces from Lebanon almost three years ago, but maintains a heavy military presence on Israel's northern frontier. Hezbollah is blamed for anti-Western and anti-Israeli terrorist acts dating from the early 1980s and is on the U.S. State Department's official list of terrorist organizations.